Having the opportunity to be involved in the construction of the world’s most modern cartonboard mill is extremely exciting! 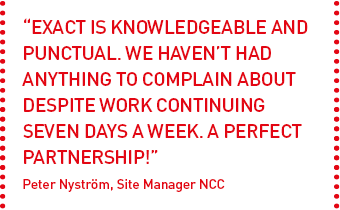 BillerudKorsnäs needed a building to house its new cartonboard machine – NNC is responsible for construction and Exact was assigned all of the surveying and setting out. In addition to the new machine hall, a new reel store, pipe bridges, a new pumping station and treatment plant for water from Lake Vänern are also being built. Extensive refurbishments have also been made to existing parts of the facility and parts of the rail tracks in the industrial estate have been rebuilt. 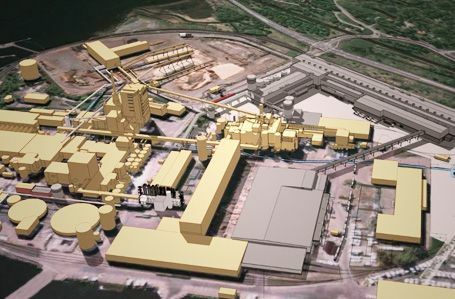 In part it is a challenge to come in as a guest to work in a large mill area with production continuing as normal. And, in part, the area is situated on former lake bed. The latter caused the ground to move, particularly when the 12,000 piles were to be set out. We really had to have our eye on everything, including the ground itself and other production. Maintaining a constructive dialogue and a favourable mood at the site meant that we encountered no problems at all working with production running. Instead, the challenge lay in charting the ground movements during the setting out process. To analyse the movement patterns and plan future work based on those, we developed a comprehensive monitoring programme that was applied daily. Our work for BillerudKorsnäs has been continuing more or less around the clock since March 2017. We have had a total of 50 surveying consultants from Exact on site.